Properties in Collegiata Church average 4.5 out of 5 stars. VILLA *** VIGNE // enjoy all the comfort, overlooking Lake Garda. Property 5: VILLA *** VIGNE // enjoy all the comfort, overlooking Lake Garda. VILLA IAGRA, WHERE NATURE AND RELAX ARE HOME. 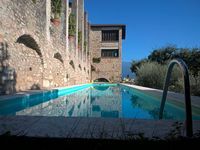 Property 46: VILLA IAGRA, WHERE NATURE AND RELAX ARE HOME. The house was beautiful, the setting fantastic, once you mastered the driveway. We had a great time and for myself, who will be 88 years old next week, a great exercise in stair climbing and swimming. It was a great reunion with the kids and everybody had a great time. The main house might need some modernization, the kitchen and the upstairs bathroom especially. Also the cleaning fee was a little on the high side, but alas! By the way Samantha was great and we really enjoyed meeting her.